Now that you've been blogging for a month or so, it's time to convert that hard work into a paycheque. Yes, here's your big chance to quit school and your job, become a professional blogger, and make as much as eight cents a month. That's tax free, my friends. But seriously, it's pretty easy to monetize your blog: just click on "Customize," then on "Monetize," register for Google AdSense, and get ready for the cash to roll in! Add a little YouTube, PayPal, eBay, craigslist, and Twitter to the mix - tap into your inner P.T. Barnum to harness some old-fashioned showmanship, press agentry, publicity, and gumption - and soon your blog can make you a hundred- or even thousandaire. Where you take it from here is up to you; I love this guy's idea (see the video below) about how to make money off of product placements in YouTube videos. Hey, does anyone want to buy one of the dresses worn in my students' Torches of Freedom video for $100? I get a 20 per cent commission on all sales, right? Hello? Hello? While we're on the topic, film critic Roger Ebert has posted an interesting article about blogging called "The Blogs of My Blog," which is where I found the first video on this post. "You are everyone, and you are everywhere. Collectively, you know everything. They say if you have 36 people in a room, it will be someone's birthday. I say if you have 36,000 comments in a blog, one of those posters will know who A. W. Wainwright is, or how a flagellum works, or what you will see if you stand at the edge of the universe and look out. And several will provide me with practical advice about how to improve my computer's speaking ability. " His post is worth reading for the talkbackers' comments alone - at 350 comments and counting, they alone probably represent the collective opinion and wisdom about blogging at this moment in time. 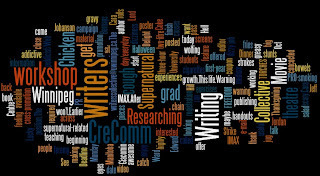 One more cool thing I saw on Ebert's website: Wordle - an online tool that generates "beautiful word clouds" from the copy or link you insert into its site. Update: And the New York Times has chimed in on Google AdSense here. I'm just not ready to "sell out" yet, Kenton. But it's okay if the students do it, because they have a built in excuse: It was part of the assignment. I tried out the Wordle and it's kind of interesting. I'll have to check it out again in the future because the two biggest words were common and sense, both of which were in my last post but don't strike me as being my most commonly used words. My above comment also raises a point in my mind. Why is there so much short-term entertainment online? It seems like Wordle and many other things I've come across are mildly interesting for a couple minutes (maybe 15 if they're really good) and then adios! never to return. Is this a residual effect of informational overload and our decreasing attention spans? Just a thought. And, yes, there are a million great short-term bits of entertainment online, but nothing that makes you keep coming back - except for the NY Times crossword puzzle, maybe.